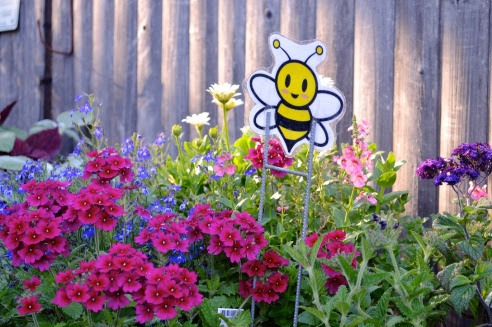 23 Jun It’s National Pollinator Week! Pollinator Porch Pots- so easy, so pretty! We’ve got them, all made by Amber who runs our annual department. Habitat destruction is the first reason. Pollinators need wild places, tall grass, meadows, prairies, hedgerows, and native plants. Our landscape is increasingly mowed and manicured. With the loss of “floral resources” the pollinators don’t have enough nectar and pollen. Habitat destruction also causes a loss of nesting sites. Bumble bees nest in the ground and in low hummocks of tufted grass. Bare soil (not mulched) is also needed for many of our native ground nesting bees. Habitat fragmentation is also occurring, It is caused by the breaking up of the important pollinator plantings into smaller and smaller pieces, isolated and unconnected. Agricultural practices are a MAJOR reason- the use of herbicides (such as Roundup Ready crops) allows farmers to spray the entire field with Roundup herbicide. It kills all the weeds and flowers surrounding the field as well as the low growing, flowering plants such as clovers that are between the rows. Soil fumigation also kills ground nesting pollinators. Land use practices also are contributing to pollinator losses. The common use of herbicides along the roadsides and the mowing of large areas (that could be left to grow and flower) reduces or eliminates floral resources and nesting sites. Recreational land practices also are at fault. Huge expanses of monoculture lawns along with the elimination of flowering meadows and hedgerows creates sterile, “neat” recreational areas, but doesn’t do a thing for the pollinators. Light pollution! Believe it or not, street lights and bright lights left on all night disrupt nocturnal pollinators such as moths and fireflies. If you use lights, have them face downward, put them on timers, or use motion detector lights. 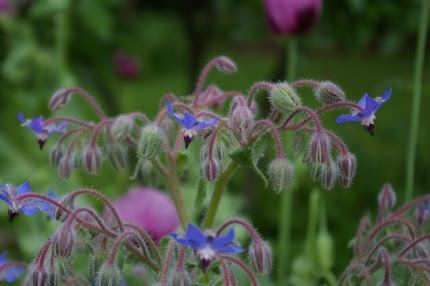 Borage is an annual herb that tastes like cucumber. The flowers are edible and filled with nutrition. The plant is covered with pollinators from morning till night. 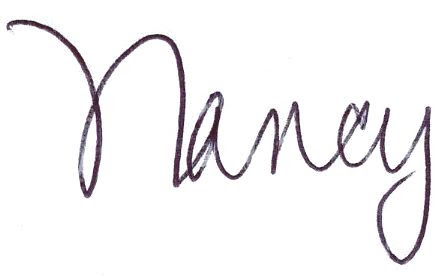 And it’s pretty. And it self sows- plant it once and you will have it in your garden. What can YOU do? A LOT! Use this week to make a few changes in your own yard and talk to your neighbors and people in your town to raise awareness. Plant lots and lots of pollinator flowers- at least three of each variety, and make sure you have flowers in bloom for the pollinators every month. We can help with that! Leave some areas unmowed, encourage tall grasses and wildflowers in some areas of your property. Connect habitats together with pollinator strips. Allow clover to grow in your lawn. Use organic practices and if you do spray an organic pest control product (such as Neem or Spinosad), spray only at DUSK as that is the only time the pollinators are not flying. They start flying really early in the morning, I get up at 5 am and I have seen it myself. 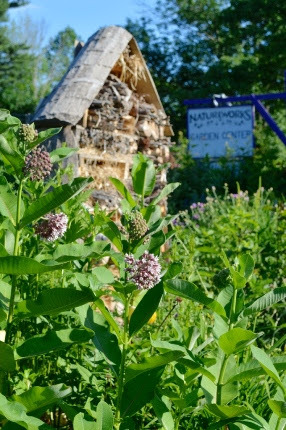 Come check out our Pollinator Hostel and learn how to build one for your yard. That’s milkweed in flower in the foreground. It smells wonderful. through the gardens to identify them on our flowers. We will also learn about our Insect Hostel and how it was constructed. Perhaps you can make one at home as a family project! One of the best ways to make a big change in our world is to teach the younger generation about the importance of our native pollinators. We are offering all kids ages 16 and under the opportunity to pot up a pot of pollinator flowers and take it home-FOR FREE! For the details on all of our National Pollinator Week events, please see the schedule below. Spread the word, tell your friends. It’s important! This Thursday night is Ladies Night!We are so excited to welcome Caroline Mulligan of Care’s Touch who will give us free chair massages. Sperry Naturals will return this year. Sandy Coppola makes really wonderful products- I purchased many of them last year and can’t wait to stock up again. Sally Noel of Ravens Wing Yoga will also be here. We will have delicious refreshments along with a tasting of locally made liqueurs from Hartford Flavor. My friend and fellow landscape designer Lelaneia Dubay makes all natural, botanically infused Wild Moon liqueurs. I met Lelaneia at the CT Flower and Garden Show where we were both judges. Besides providing her clients with beautiful gardens in the Hartford area, she is passionate about providing us with delicious, unusual liqueurs. We will be sampling rose, lavender, and cucumber! In case of inclement/stormy weather, Ladies Night may possibly be postponed. Please call Thursday if weather does not cooperate. 203-484-2748.
the joys of the natural world. Registration information can be found below. Sign your kids up today;you can shop while they make a suncatcher. New plants continue to arrive each week. 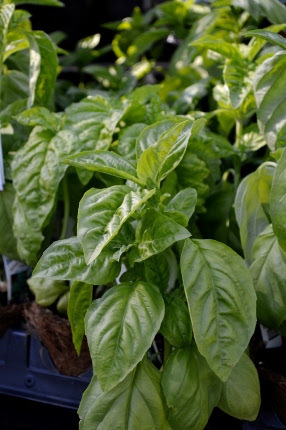 We are restocking our organic herbs such as basil, rosemary, dill, parsley, and cilantro. 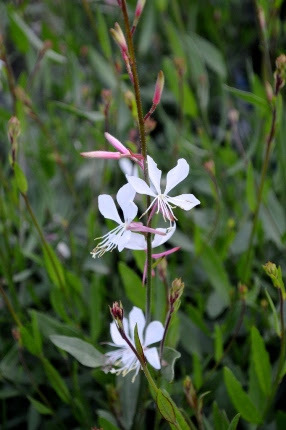 Gaura blooms all summer, into the fall. When bees land on the flowers, the flower stalks “dance” back and forth. It’s a great native prairie plant. 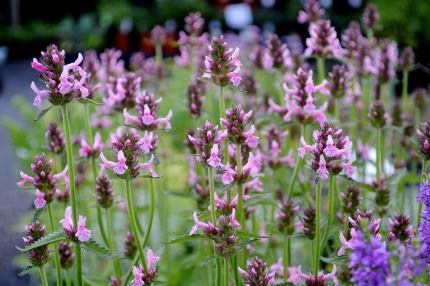 Fresh color is here with Stachys ‘Pink Cotton Candy’ which waves in the wind, beloved by pollinators. Phlox paniculata ‘Jeanna’ is in the house- she is so pretty with pointed panicles of lilac flowers in July and August, one of our staff favorites. Right now, an old favorite that has stood the test of time, Phlox maculata ‘Miss Lingard’ is in full bloom, clean as a whistle, the star of the show. June is in full bloom. It is HIGH SUMMER, when the sun is highest in the sky, the days are as long as they will be all year, and the birds wake us up at 5 in the morning. It’s a great time to plant, a great time to garden, a great time to be alive. If you sit still, you can watch the garden grow. Summer is hummingbird season, and we’ve got them everywhere in the nursery yard. The warm temperatures sets the butterflies flying, and we have been collecting eggs and raising butterflies indoors already. I hope you can join us for National Pollinator Week. Stop in for a visit, sign up for one of our many workshops, come to Ladies Night or the Saturday morning garden walk. Stroll the gardens, be inspired, catch our enthusiasm, learn a lot…come to Natureworks this week!